ABOUT THE SAND AND THE EVER CHANGING BEACH: In the spring, the tide begins to carry sand in from the ocean and deposit it on the beach. The sand on the beach becomes deeper each week and by late summer can be several feet deep. During the winter, the process is reversed. The tide begins to carry the sand back out to the ocean. At times there can be no sand on the beach exposing the cobble (football sized rocks) that is ordinarily covered by sand. The cobble can be dificult to walk on. SEE FOR YOURSELF- CLICK ON 'click on-video tour' BELOW (under links to more information. Walking through the door for our 9th visit was as awesome as our 1st visit. Don knows how to make his WOG guests feel at home, takes care to ensure we’ll be counting the days ‘til next time’! Quick return of our deposit is always much appreciated. Already scheduled our 2020 dates and can’t wait to sit on the familiar deck, watch the resident seagulls, walk on the beach, photograph and listen to the sounds of the ocean, enjoy the big screen TVs and be in close proximity to our now favorite places to visit and dine. Rain or shine it’s a magical place. Don, once again, you and WOG are amazing! See you in 2020, yes, we’re counting the days until our 10th visit! 10th visit coming up next time you visit? That's fantastic. And I couldn't possibly have better and nicer "repeat offenders" than the two of you. Thank you so much for being my vacationers. Best vacation place in Malibu! We enjoyed our stay at the Walls of Glass house. We had no issues at all. The house was clean and kitchen stocked for all our cooking needs. We cooked dinners and breakfast at least four out of the seven nights. 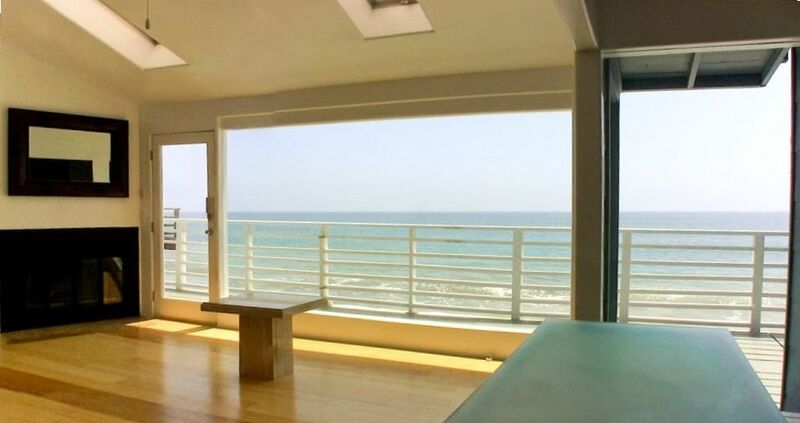 The house is right on the ocean so you have the best view in town. Love listening to the waves crashing into the shore and rocks lulling us to sleep. We’ve stayed at another rental on the ocean too a couple of miles by the pier but we liked this better. It’s walking distance to Moonshadows and Dukes restaurants. We had the perfect holiday weather too. Planning on doing this again soon! The owner Don is very responsive and nice. We needed a few more towels and voila there was a bag of brand new towels delivered in an hour. This was the best VRBO we’ve stayed at! Wow, to be honest I think I was mostly lucky. Lucky to get an over the top review like yours and lucky to have you as vacationers. Thank you Keith and Elaine for my lucky review. It feels good to get a pat on the head now and then. Can't count the number of times we've enjoyed staying at Walls of Glass but certain the number will climb. Perfect location and views, views, views. Always like-new clean and well maintained. The owner is responsive and delightful. And the place is so comfortable it soon becomes your home away from home. Linda, thanks for a delightful review. I'm really glad you enjoy the place so much. I'm thrilled to see you becoming a "repeat offender." When we walked in the door, we were overwhelmingly impressed - the view was more striking than the posted VRBO pictures! We found the home to be peaceful, roomy and contemporary - just perfect. We were entertained on a daily basis by seagulls (residents 'Pink' & 'Fred'), seals and dolphins. The constant roar of the ocean was both energizing and relaxing. The owner is so committed to his guests - he communicates to you multiple times prior to your stay, provides a comprehensive list of activities, attractions and restaurants, and wants to talk to you when you arrive to ensure your safe arrival and your comfort. Superb customer service. We would highly recommend this Malibu gem. Looking forward to booking 'Walls of Glass' again in the future! We had an incredible time at the Walls of Glass. It was even better then the pictures and videos. The views and the sound of the ocean were amazing. It is a great location and close to everything. We couldn’t of asked for anything more and we will be definitely be back soon. We loved our stay. Don, the owner of the property, was wonderful. The house has fabulous views and is a great place to relax and unwind. We hope to return soon!